The northbound exit signals in Emsingen are now fully functional, including turnout routing via JMRI. I mounted the semaphores a few days ago, and connected wiring tonight. In other news, I discovered that large locomotives (electrics with 3 axles per truck, or a steamer) derail on the entry turnout to stub-ended staging. The loco climbs up while taking the curve, so it appears the turnout is out of gauge. Sigh. 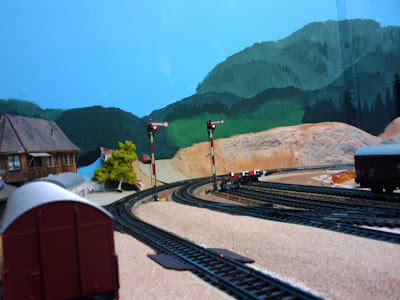 I thought I was done with surgery in that corner of the layout. Hochwald trees and scenery. How do I make forest ground?